We’d love your help. Let us know what’s wrong with this preview of From Authors to Entrepreneurs (F.A.T.E.) - The Personal Side of Indie Publishing by Omar L. Harris. 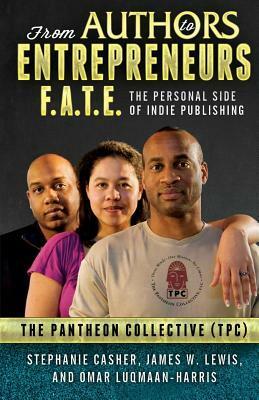 To ask other readers questions about From Authors to Entrepreneurs (F.A.T.E.) - The Personal Side of Indie Publishing, please sign up. Omar L. Harris hails from Pittsburgh, PA and is passionate about leading teams, high-performance coaching, and inspiring more people to adopt the servant leader mindset. He is a Gallup Certified Strengths Coach; a bestselling, award-winning author; independent publishing guru; entrepreneur; and twenty-year veteran of the global pharmaceutical industry. He is the author of three titles: One Blood, Omar L. Harris hails from Pittsburgh, PA and is passionate about leading teams, high-performance coaching, and inspiring more people to adopt the servant leader mindset. He is a Gallup Certified Strengths Coach; a bestselling, award-winning author; independent publishing guru; entrepreneur; and twenty-year veteran of the global pharmaceutical industry. He is the author of three titles: One Blood, From Authors to Entrepreneurs F.A.T.E., and Leader Board: The DNA of High Performance Teams.